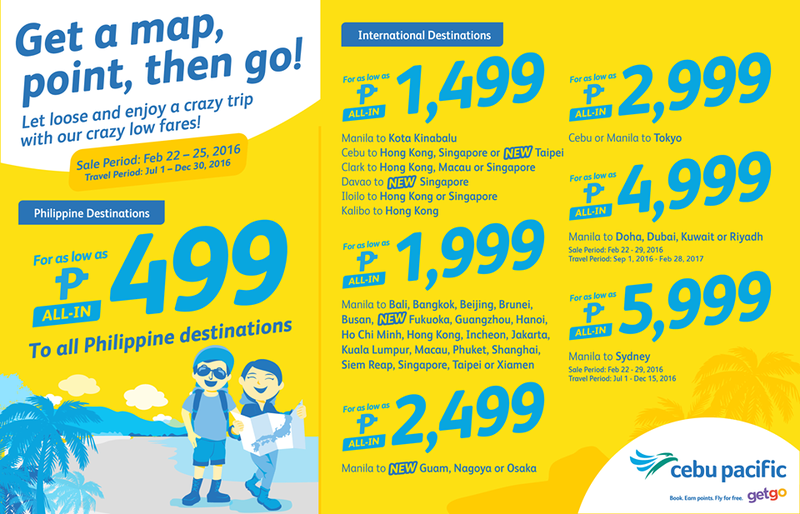 Piso Fare 2019 Promos Until 2020: Cebu Pacific's P499 Promo Fare! Cebu Pacific's P499 Promo Fare! Piso Fare 2016: Cebu Pacific launched their latest P499 promo fare on some selected destinations coming from Davao, Iloilo and Zamboanga. And if you are from Manila, you can also avail another affordable fare going to Bacolod, Boracay, Butuan, Cagayan de Oro and other key cities in the Philippines. For international trip, there is also a cheaper fare going to Tokyo from Cebu or Manila. Or perhaps, you may visit the middle east like Doha, Dubai or Kuwait or even Riyadh for a one-way fare of P4,999. How to book pwede po hihingi ng telephone no nyo. Pls,update me if there is Promo??? How can we book from Dubai to Manila? Tanung no Lang po Kung kailan ang Alis ng Manila to bacolod..salamat po! How to book 2 tickets from Manila to Boracay? This coming Month of May. Air Asia Philippine's 20% Promo! New Year Fares From Cebu Pacific!